I finally completed my 2009 albums and am sharing the final layouts here today. I ended up with two volumes and really enjoyed getting these final stories and photos scrapped to make them complete. 2009 was the year my Daddy retired and my parents moved closer to us. I'd already documented the many trips they made searching for a new home and the story of the home they were leaving, so I captured the story of finding their new home in this 8 1/2 x 11 layout. Journaling reads: The phone rang very late one night in April, waking me from a sound sleep. Without even a Hello, Mama said, "I need you to go look at this house tomorrow." So early the next morning I did. It had everything they were looking for - a big sewing room for Mama, lots of shed and garage space for Daddy, and a place for Sandra's RV. 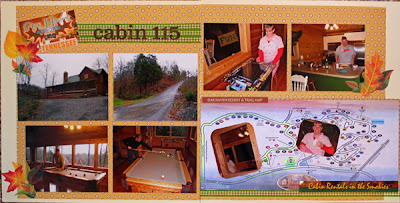 I documented our fall trip to Tennessee with several layouts, including this two page spread showcasing photos of the luxury cabin we enjoyed. I used a few pieces of memorabilia including a map of the resort and pieces cut from a postcard. 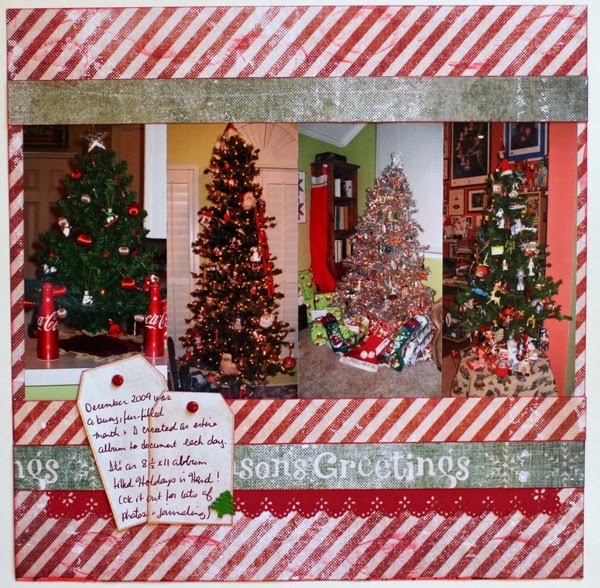 I used some distressed Tim Holtz papers to display photos of our Christmas trees. that year. 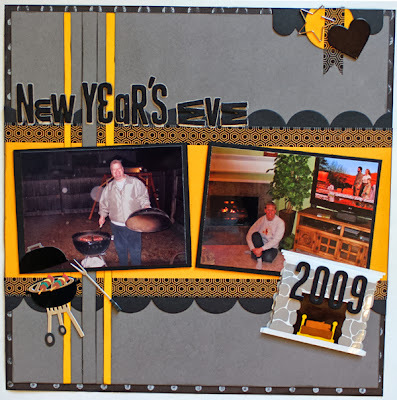 And finally a fun layout showing us relaxing at home on New Year's Eve. 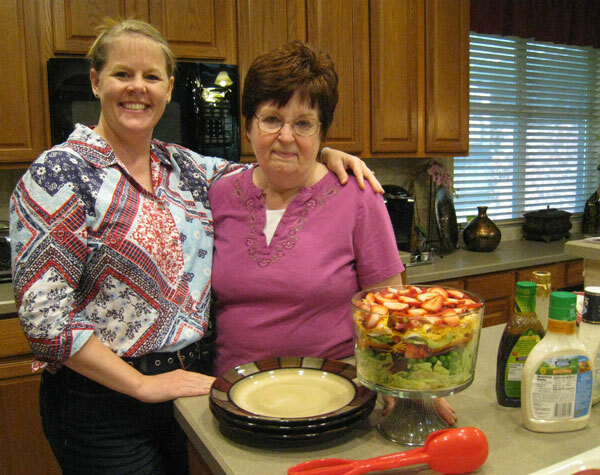 Last week's room in the My Heart - Christ's Home Bible study I'm leading was the dining room, the room of appetites and desires. We had a great discussion at our meeting on Wednesday about the things we crave and how we can turn out focus to crave to do the will of the Lord. I set up a table with a variety of place settings representing some of the things we crave - china place setting to represent food & fine dining, empty Coca-Cola and Chips Ahoy packages to represent snacking, a piggy bank to represent money, make-up and nail polish to represent beauty, photo & plaque to represent honors and recognition, DVDs to represent entertainment and fame - none of these cravings are bad in and of themselves, however when they are our main focus and draw us away from our relationship with the Lord we need to re-evaluate their important in our lives. We ended the discussion with a reading a John 13:1-16 where Jesus demonstrates a wonderful example of service as he washes the disciples feet and teaches them (and us) to serve others. I'm using 12x12 divided page protectors for my LSNED lessons this year, with two 4x6 sections for each day. I'm reading Shimelle's prompts each day, however I'm using those more as a reminder to be aware of what I'm learning (or remembering) throughout the day rather than using the prompt idea itself. Today I'm sharing six more lessons from earlier this month. I signed up for the BPC Art+Science workshop and was not surprised when the pre-class creativity test showed that I am left-brained! During a lovely relaxing Saturday at home, I realized that 1,000-pieces puzzles are becoming easier for us and can be put together in a few hours, so it's time to buy some puzzles with more pieces! And I was delighted to learn that Shimelle created a Pinterest board for all the Glitter Girl episodes - what a great resource to scroll through when looking for inspiration! In the spirit of learning and trying new things, I tried a new recipe - Tennessee white chili (definitely a keeper). As I was preparing to head out of town for a crop, I took time to give myself a manicure & pedicure and it occurred to me that friends not only know your favorite color, they give you nail polish in that color. And finally I lucked out when I discovered that the Project Life album I picked up at Michaels was 60% off the day I stopped in to find a new album for my Faith Walk layouts. I haven't completed any of my lessons passed the 18th, however I am continuing to record my daily activities and will hopefully find time this weekend to look back over those notes to discover the lessons in each day. How is your September coming along? Have you learned anything new lately? 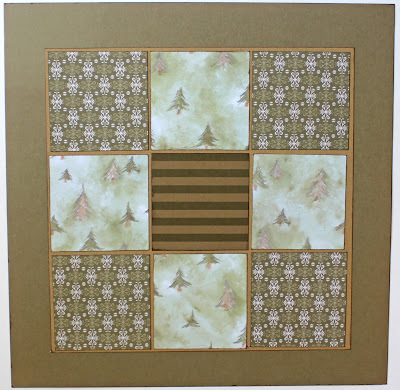 I created this 12x12 grid design as a starting point with pieces from my brown scraps. I'm enjoying this way of using up and cleaning out scraps and the challenge of finding photos to work with the layout design and color scheme. Here's what I ended up with for this grid. I'm also enjoying using a variety of letter stickers/thickers to create titles. What are you enjoying this week? This past week in the My Heart - Christ's Home Bible study I'm leading, we discussed the first room in our heart: The Study. 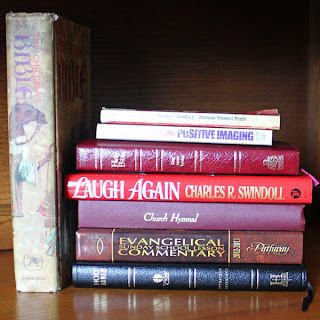 The Study is our mind, the control center of our heart, and is filled with thoughts and images, just as the study in our home might be filled with books on shelves and portraits or art work on the walls. We discussed the thoughts that crowd our minds at times, and I brought a visual to help us see what some of these thoughts might look like on a bookshelf. 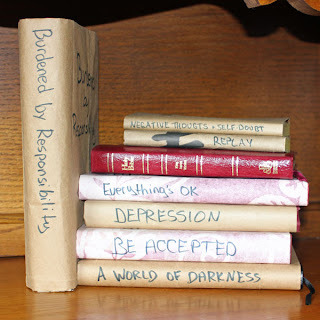 In this case, I covered several books with paper bags and gave them titles that reflect our thoughts. 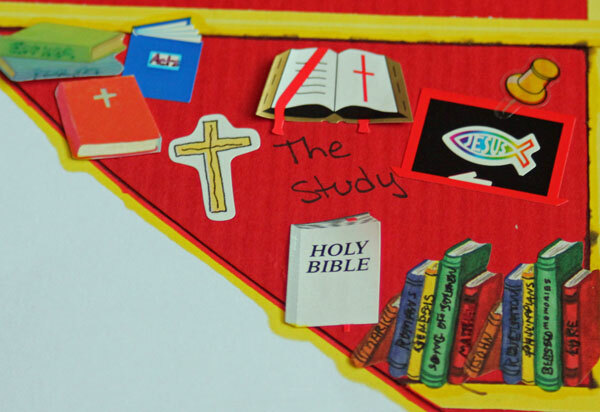 There's also a Bible in the mix to represent the scriptures that we've learned and are a part of our thoughts. However, John 10:10 tells us that Jesus came that we would have life more abundantly, so I uncovered the books to reveal ideas that would enable us to have a more abundant life in Christ. For each example, I also gave a scripture to reinforce the illustration. For example, in Matthew 18:3, Jesus says, Assuredly, I say to you, unless you are converted and become as little children, you will by no means enter the kingdom of heaven. I uncovered a Children's Bible to remind us that we are children of the Lord and can go to him with our needs and worries, just as little children go to their parents for their needs and security. I also filled in one section of the heart I shared last week (using supplies I have on hand) to represent the study. I added books around the edges. I also "tacked up" a "photo" of Jesus in a central place to remind me that when negative or worrisome thoughts enter my mind, I should stop and center my thoughts on Him. ... take captive every thought to make it obedient to Christ. 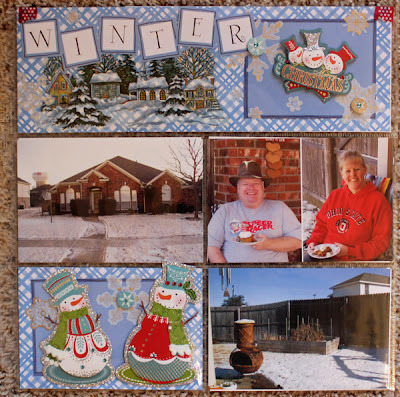 It's been a long time since I've been to a Stampin' Up party or ordered any product, however I was excited to sign up for a Christmas Card Class offered by a local consultant. 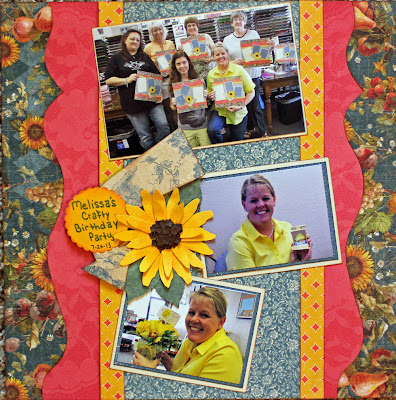 The class was free with a $30 order, and we created 12 cards - 2 each of six different cards. Two of the cards involved embossing, which I have not been very successful at, so I thought this would be a good chance to get some hands-on instruction. I was not disappointed and came away with some great cards to add to my growing stack of Christmas cards. Along with embossing with ink and embossing powder, the class included die cutting and embossing with the Big Shot, stamping, punching, and (the necessary and all important) snacks! One of my teenage friends attended the class with me and we both came away inspired and feeling like we had learned some new techniques. Do you use and purchase Stampin' Up products? Have you attended any fun classes like this one in your area? 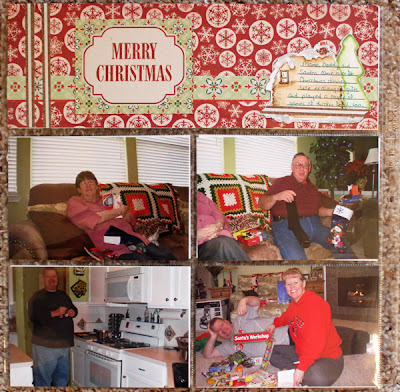 As I neared the end of the year in my 2009 scrapbook, I decided to add in two divided page protectors to showcase Christmas photos. We had a light snow on Christmas Eve and awoke to a beautiful sunshiny white Christmas! I used the front of the first divided page protector and an entire sheet of cute snowmen dimensional stickers for this layout. 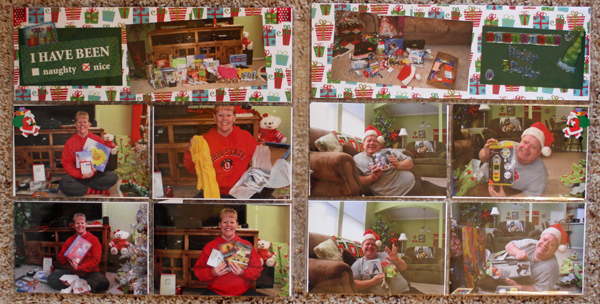 The next layout is a two page spread using the back of the first divided page protector and the front of the second one and showcases photos of us opening Christmas gifts. Of course that left the back side of the second page protector to fill in, which I did with more photos from Christmas Day. Patterned paper, a few border strips, a title block and journal box were all that were needed to complete this layout. 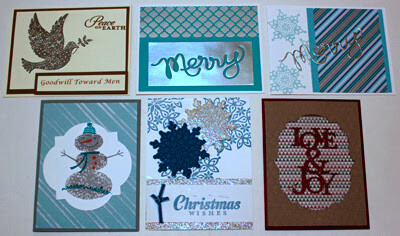 These Christmas layouts remind me of the cards I'm making, so I'll be sharing a few of those very soon! 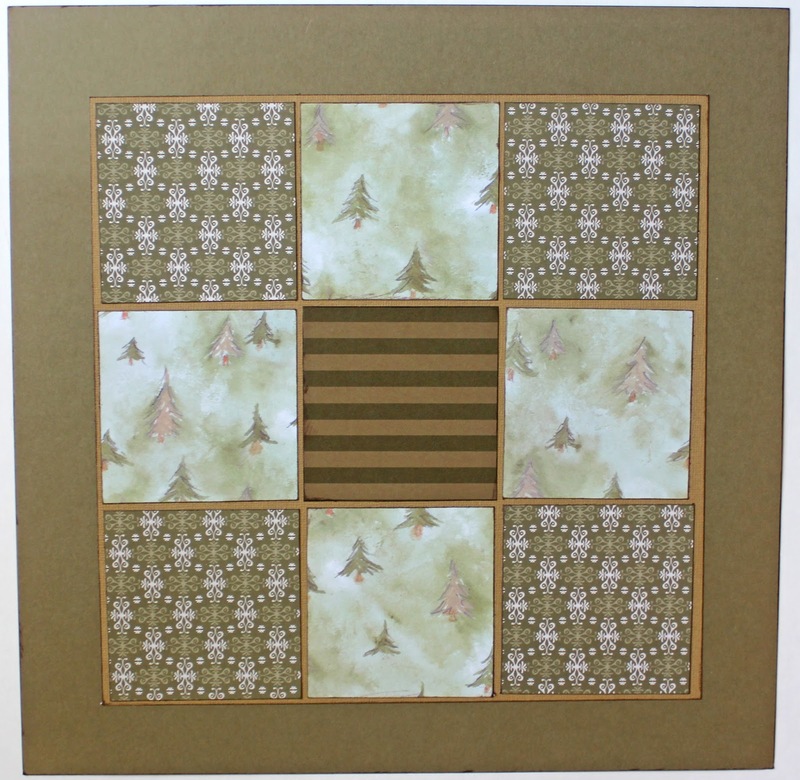 Have you worked on any Christmas layouts lately? For my birthday this summer, Robbie gave me several small canvases in various sizes. I had fun adding paint, patterned paper, cardstock, chipboard, flowers, a brad, and scrabble tiles to create this mixed media canvas that now hangs in our bedroom. Have you created any mixed media canvases lately? What types of items did you include? I'm using 12x12 divided page protectors for my LSNED lessons this year, with two 4x6 sections for each day. I'm reading Shimelle's prompts each day, however I'm using those more as a reminder to be aware of what I'm learning (or remembering) throughout the day rather than using the prompt idea itself. Here's a look at three more things I've learned this month. I spent the day at home last Tuesday and had to remind myself that a quiet day at home can be productive or not . . . it's up to me! I decided to make it a productive day and moved my scrapbooks, photo albums and mini-albums to our new Expedit shelf unit in the front room, which I'll call our Memory Shelf. Wednesday was the first day of the Bible study I'm leading this fall, and I learned there are nine ladies signed up for the Bible study from five different churches. 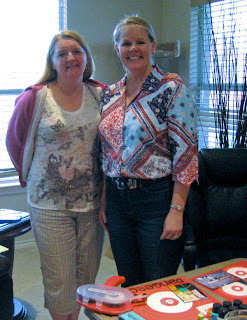 Thursday I enjoyed an inspiration day with Cheri. On our tour of Southfork Ranch I learned that several things had changed since Robbie and I had been there last year. *Elana's cottage is still set up and ready for filming to begin in October. I'm so glad I prepped my journal cards and chose my divided page protectors before the month started because it is making it quick and easy to get these lessons recorded! If you've been following along with my blog the last few weeks, you probably know that I'm leading a ladies' Bible study this fall. I love to study the Bible and get together with other women and discuss what we're learning and how it applies to our lives. I also enjoy incorporating scrapbooking into my life anytime I can! So, I created a simple visual that I'll use each week of the study. The My Heart - Christ's Home Bible Study is based on a sermon given by Robert Boyd Munger in 1947. He shared that when we invite Christ into our lives, He comes to live in our heart and uses the analogy of the rooms in a home to show how we can prepare our heart as a home for Christ. 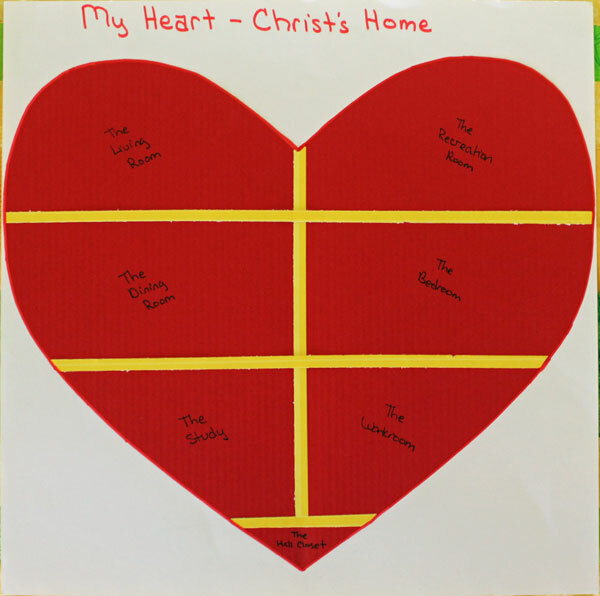 The heart/house is divided into seven sections/rooms that we'll be discussing in our study. My plan is to add to this layout each week and fill in the rooms - I can picture this all in my head, but I'm not sure how it'll look in the end. I'll share the sections with you as I go along. 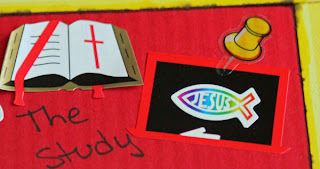 Have any of you read the My Heart - Christ's Home pamphlet or children's book or participated in this study? I'm using 12x12 divided page protectors for my LSNED lessons this year, with two 4x6 sections for each day - one for the lesson that I'm adding to my pre-made journal cards & one for a photo. I am reading Shimelle's prompts each day, however I'm using those more as a reminder to be aware of what I'm learning (or remembering) throughout the day rather than using the prompt idea itself. Here's a look at my lessons for the 7th through the 9th. Last Saturday I continued working on my re-arranging project in the front room and was reminded that rearranging, deep cleaning, organizing, and decluttering can lead to discovering (or rather re-discovering) item we've forgotten about. I was surprised to discover several platters that we haven't used in a while and a cute bread basket hiding in the buffet! On Sunday I learned a new skill! Double-clicking the round button on my iPhone allows me to see which apps are active and gives me the ability to turn them off, which saves battery life! No wonder I was having to charge my phone every day - every app on the phone was active. 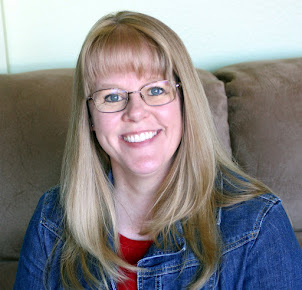 And then on Monday I got to spend the day cropping with Cheri and remembered how friendships formed online and through blogging are even better when they lead to in-person get-togethers, especially when scrapping is involved. How is your LSNED coming along? Have you had any surprises in your learning this month? 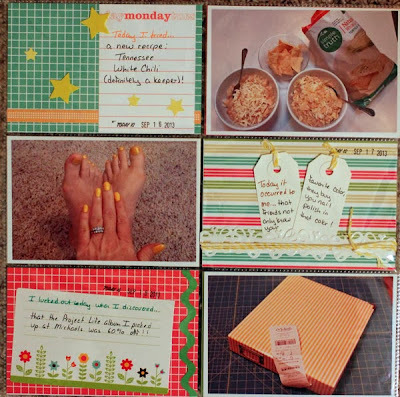 As I was catching up on some blog reading this morning, I noticed quite a few friends joining in with Abi's challenge to find a photo and try and tell its story in just twenty words and I knew it would be a great way to share about my latest inspiration day. Mirrors . . . Southfork Ranch . . . the JR & Sue Ellen suite . . . Cheri’s reflection . 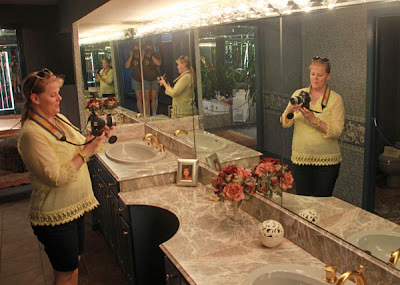 . . taking a photo of me . . . taking a photo. Cowboy hats. Jock’s 1978 Lincoln Continental. Ewing 1 license plate. Lincolns & Longhorns gift shop. Texas. 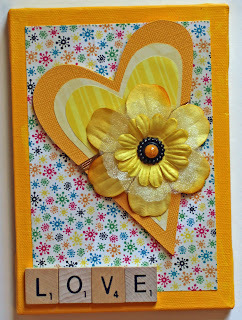 Blog friends inspiration day! We saw quite a few movies the past few months, all of which will be coming out (or have already) on Blu-ray soon. Robbie keeps track of the movies we really enjoy and want to own so we are sure to get them on pre-order for the best prices. 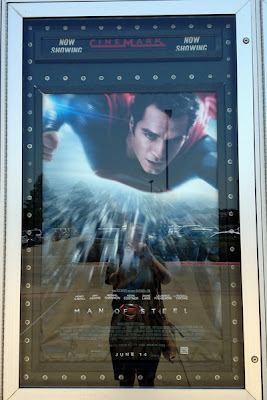 There were several movies out that we didn't get to see, however here's a look at a few of the movies that we saw and will definitely be adding to our collection. 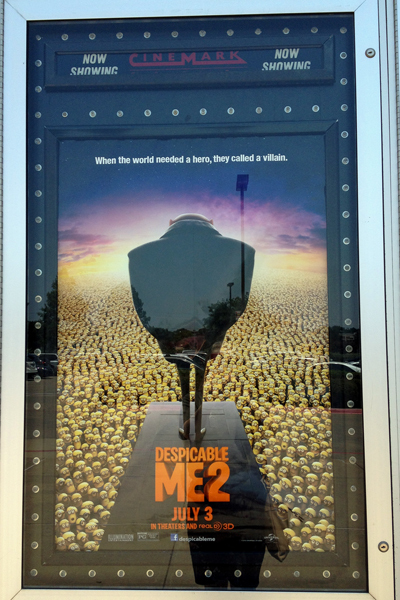 Did you make it to the movies this summer? Do you watch for them to come out on Blu-ray so you can enjoy them again? 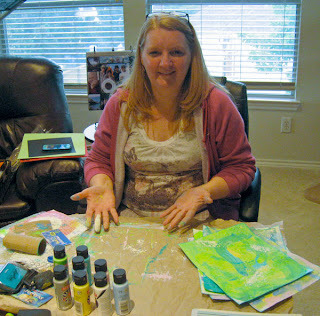 Remember that layout me and Mama and my crafty friends created at my crafty birthday party/class? Like many classes, we ended up with a completed layout, except for the photos. While I love learning and practicing techniques (like using templates and creating a flower with 100 small pieces), I often avoid these types of classes because I'm not sure I'll have photos in the right sizes to go on the layout. However, I decided the perfect photos for my birthday layout would be the ones from the party/class itself. I printed them at home so they fit perfectly. Mama liked it so much she had me print photos for her layout, too! 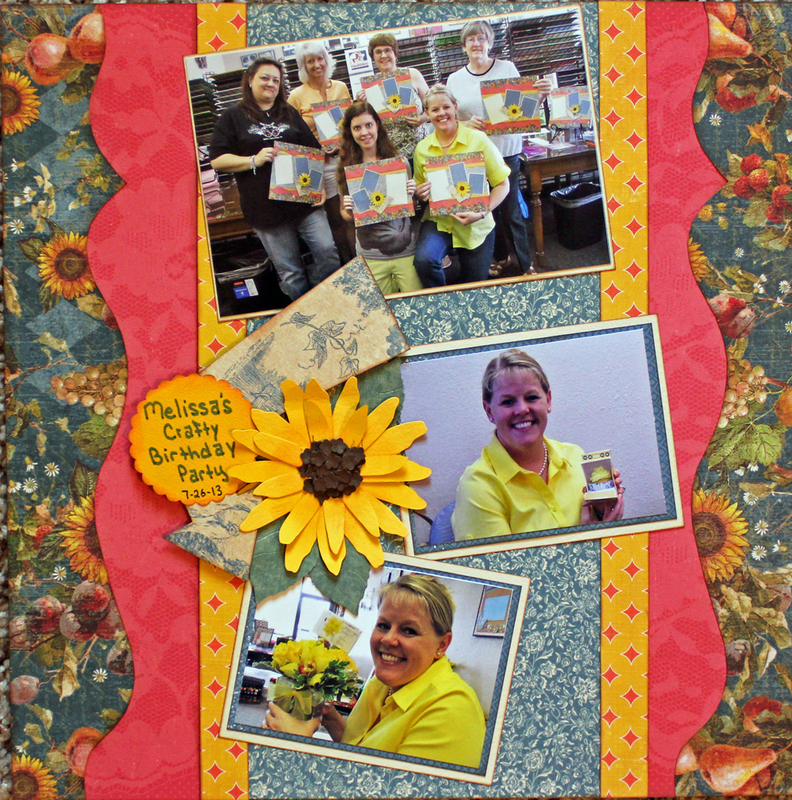 Do you take in-person classes that result in a finished layout? Do you add photos after returning home? Or are they piled up somewhere waiting to be used? Guess Who I Cropped With Today? Cheri is in the Dallas area visiting her mother, Sandy, and they invited me over to scrap today. We had a great day! 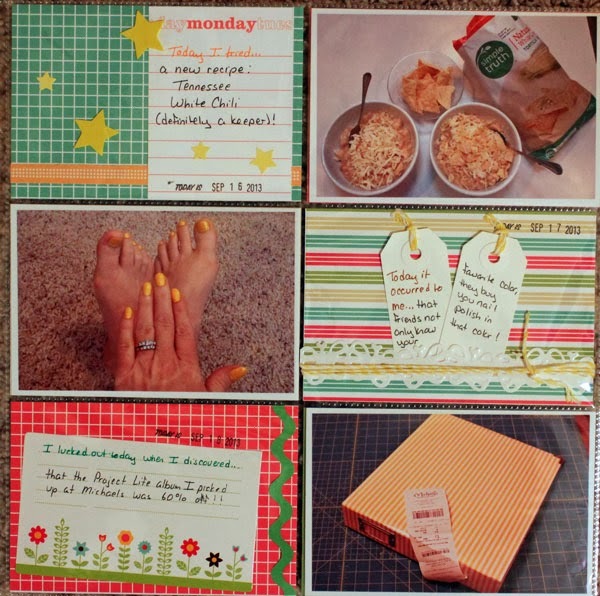 I put together six layouts and sorted my latest photo prints into a storage binder while Cheri got messy creating backgrounds for some Week In The Life pages and creating a couple of double page layouts. Sandy has a lovely home and allowed us to root through her stash as we worked. She also put together a delicious 7-layer salad (although I think she added some extra layers!) for lunch and a yummy asparagus frittata for supper! 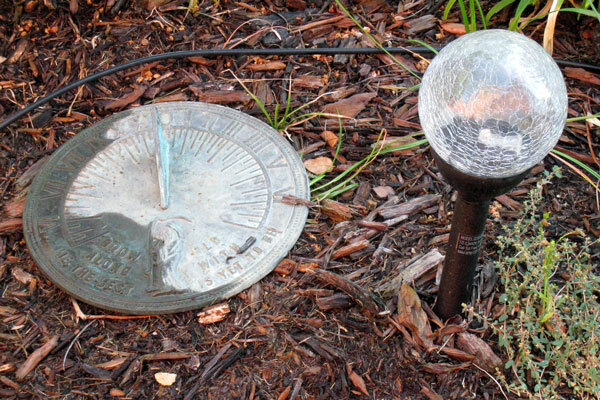 And as an extra treat, Cheri took me out to the backyard where I found the second bonus item on Rinda's 2013 Summertime Photography Scavenger Hunt - a sundial. That's the final item I needed to complete this year's hunt! Definitely a great way to start the week! I'm using 12x12 divided page protectors for my LSNED lessons this year, with two 4x6 sections for each day - one for the lesson that I'm adding to my pre-made journal cards & one for a photo. I am reading Shimelle's prompts each day, however I'm using those more as a reminder to be aware of what I'm learning (or remembering) throughout the day rather than using the prompt idea itself. Here's what I learned on the fourth, fifth, and sixth. Wednesday I attended the library book club meeting where we discussed Where'd You Go, Bernadette by Maria Semple. (See my review of the book here.) A cruise to Antarctica is a huge part of the story line in this book, and one of the librarians shared some slides and information about Antarctica as part of the meeting. I learned that the Amundsen-Scott South Pole Station is at the geographic south pole, that there have been three structures constructed at that site, and the ceremonial South Pole is there. I did not think to snap a photo during the meeting, so I found a photo of the ceremonial South Pole on Wikipedia to include on my LSNED page. 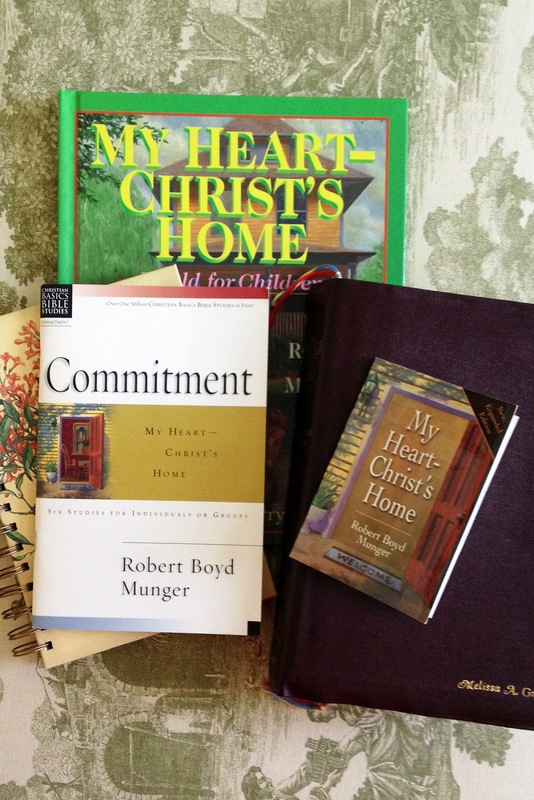 Thursday I worked on preparations for the Bible study I'll begin leading these week and learned that the My Heart - Christ's Home pamphlet (& Bible study & children's book) was based on a sermon Robert Boyd Munger first shared at First Presbyterian Church - Berkeley in 1947. I'm sure I've read that information before but it struck a chord with me this time as I'll be leading the study at a First Presbyterian Church (although it's 1700+ miles from Berkeley!). I spent the day Friday moving the bookshelves (& all the books) in our front room from one wall to another as I'm re-arranging and re-decorating here at home. The bookshelves had sunk into the carpeting and were a little difficult to move, which made me contemplate how when something (or someone) has been in the same spot for a long time, it may take some extra effort to move it and get it unstuck from that spot (or situation). 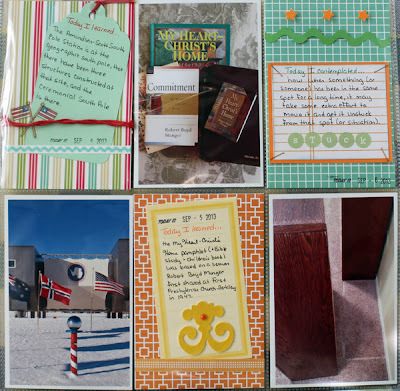 The divided page protector I used for these lessons has portrait orientation sections, so I put the journal box and photo for each day in one column. ﻿As always with this project, I'm amazed at the lessons I learn each day when I'm actually making the effort to be more aware of them! 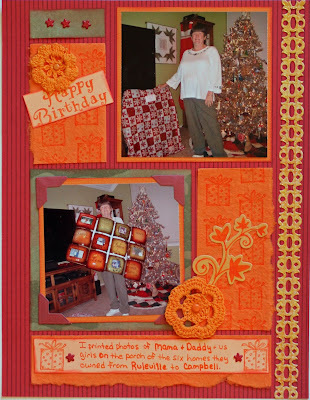 After using the grid design on my Sewing layout, it is quickly becoming a favorite of mine because it's a simple concept, can handle a number of photos in various sizes, and allows room for a variety of embellishments. I recently used this design to create two very different layouts. 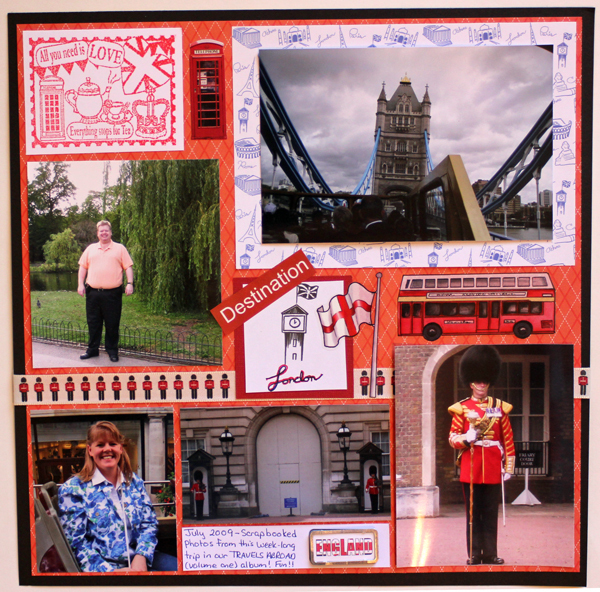 This first layout is 12x12 and showcases a few photos from our 2009 trip to London. First, I wanted to use the wonderful Jubilee Stamp that Jo sent me earlier this year and a strip of ribbon that Jacky included in a swap package. I started with those two items and several others that I pulled from my stash - a photo mat, a London block cut from an old scrapbooking calendar, and miscellaneous stickers. 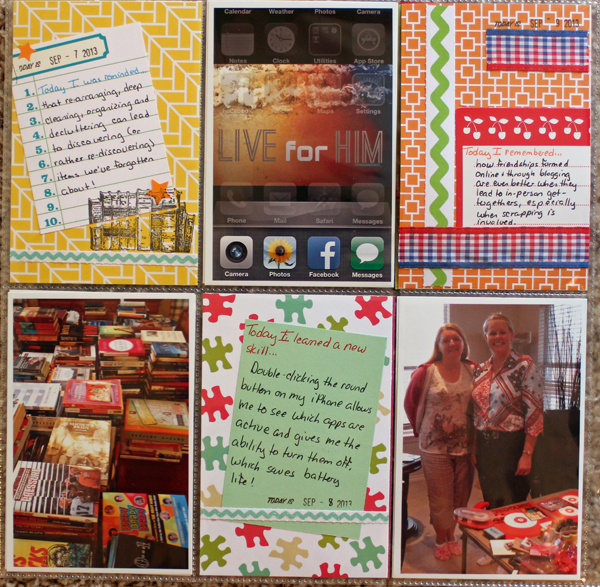 With the addition of my photos and a journaling block that cross-references our Travels Abroad album (where the stories and photos from this trip are scrapped) I have a completed layout that makes me smile! The second grid layout is 8 1/2 x 11 in size and showcases two photos. I wanted to bring attention to the framed birthday gift in the second photo, so I chose colors from that hoping to lessen the prominence of the Christmas tree in the background of the photos. 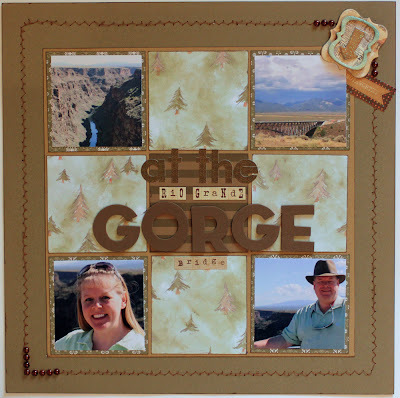 I added a border strip and several pieces of torn and stamped handmade paper and used a grid design to put it all together. I really like how this one design can be used to create layouts that are so unique - I'll definitely be using it over and over. 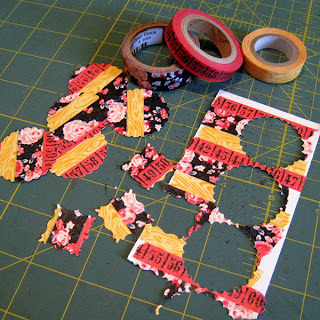 Washi Tape - It's Everywhere! Have you noticed that washi tape is everywhere? 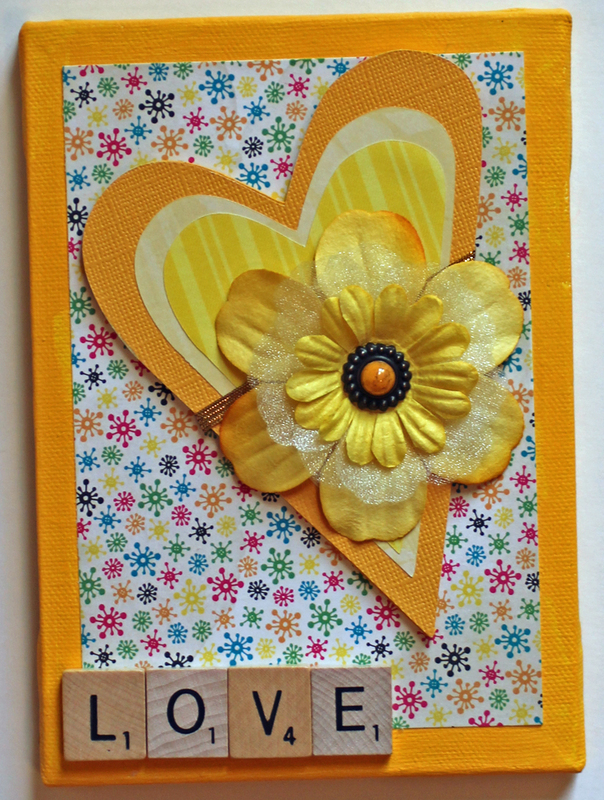 And I don't just mean in scrapbooking! 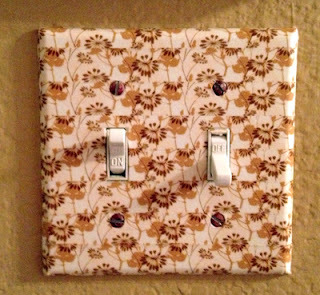 I've noticed it cropping up in lots of magazines lately, including DIY and home décor. 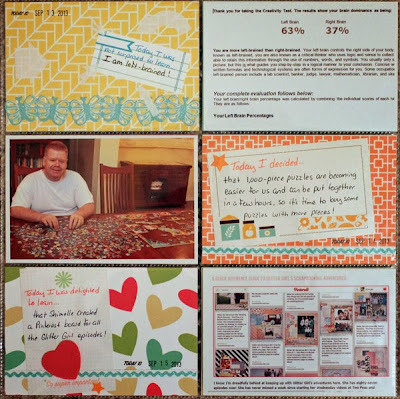 One idea included using it for a kid's art project, allowing kids to create designs and sketches by placing washi tape on walls. I took another of the ideas and added a little pizazz to my light switch cover. 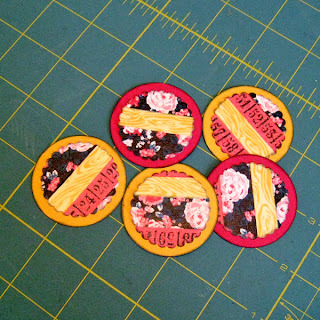 Here's a little tutorial on creating these fun embellishments. 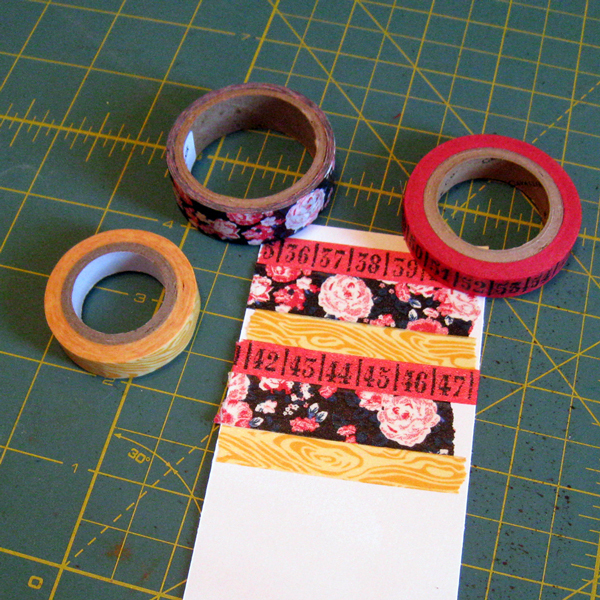 First, place strips of washi tape on a piece of white cardstock, alternating the colors and designs. 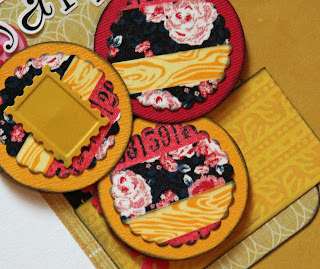 Then simply use your punches to create unique and colorful embellishments. I mounted my scalloped circles onto punched cardstock circles . . .
and then clustered a few of them together on a layout. This is definitely a technique I'll be using often. How about you - have you tried anything new with washi tape lately? I'm using 12x12 divided page protectors for my LSNED lessons this year, with two 4x6 sections for each day - one for the lesson that I'm adding to my pre-made journal cards & one for a photo. I am reading Shimelle's prompts each day, however I'm using those more as a reminder to be aware of what I'm learning (or remembering) throughout the day rather than using the prompt idea itself. 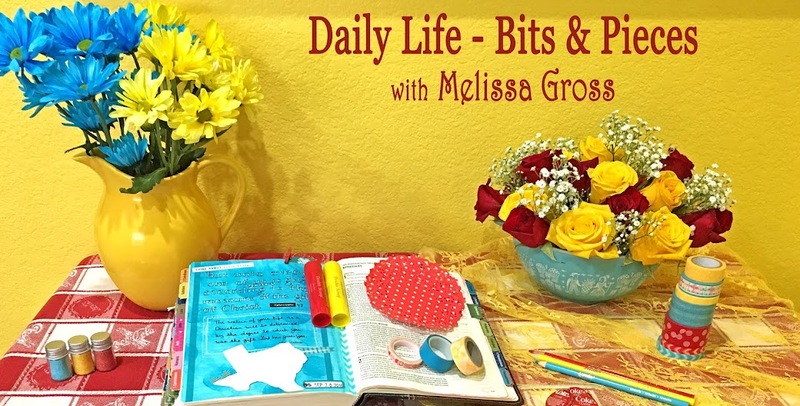 Here's a look at my lessons for the first three days of the month. Sunday morning, Robbie was up early and inspired to make breakfast burritos, however the flour tortillas were past their prime and he ended up making cheesy scrambled eggs, pepper bacon, fried potatoes, and toast instead. While we were eating, I made the comment that sometimes the inspiration is just the jumping off point and then realized that was a great lesson to remember. We spent a quiet day at home Monday, and I once again realized how much I appreciate online friendships & interaction. Tuesday was Ellyn's monthly Crafty Tuesday and I learned how to play Traders Dice (a new-to-me game) with buttons and came home with some really cute buttons (that I immediately put to use on my journal cards!). Have you learned anything new so far this month? As promised in my non-fiction book reviews post, today I'm catching up with reviews of some of the fiction books I read over the summer. Francine Rivers' Redeeming Love is one of my favorite books. I re-read it early in the summer to discuss with my book club. This is the life story of Angel who was sold into prostitution as a young girl. The story is set in the mid-1800s, and she eventually escapes to the California Gold Country, only to discover that she only knows one way to survive. When Michael Hosea comes to her in the brothel and only wants to talk about taking her away, she is confused and angry with him for arousing hope in her. Eventually he does rescue her and gives her much grace as she adjusts to a new way of life. However, inside she feels unworthy and runs away from him. This is a story of redemption and is based on the story of Hosea and Gomer in the Bible. I highly recommend this book! Our Strange New Land, Elizabeth's Jamestown Colony Diary is another book in the young adult Dear America series. This story is the diary of a young girl who sails from England to Jamestown, Virginia, to establish the first English colony. The story chronicles the hardships these settlers faced and how they overcame them and determined to remain in America. These books are quick easy reads, yet I always learn something from the historical facts presented within the story and at the end of the books. I checked out Unrivaled from the library the day Robbie and I turned in our summer reading forms. We both have quite a few books in our to-read piles, so we were just going to run in and out and not check out any books. (big grin) Of course, we had to stroll through the new books on display . . . and we walked out with seven books between us! I didn't know much about this book other than what I read on the back cover, but it turned out to be a very good read. 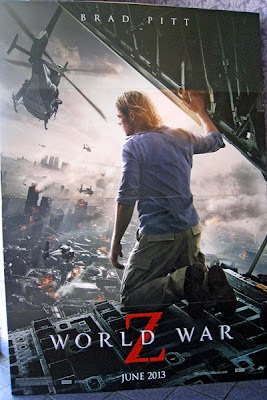 It's a love story that's intertwined with the story of a candy-making business rivalry between the couple's fathers. Of all the books I read this summer, Me Before You was the most disappointing. (Warning - major spoiler ahead!) I had read a review of the book in a magazine and it sounded like a story of hope and encouragement. Louisa is hired as a caregiver for Will, who was injured in an accident a couple of years before, leaving him a quadriplegic. I got the impression the book was about how Louisa encouraged him to embrace and enjoy the life he had, however it turned out that the book was basically a statement that it is ok for someone to commit assisted suicide if they so choose. While the family was understandably heartbroken, the book portrayed a beautiful picture of them all around his bedside as he took his own life. I know there's lots of controversy over this topic, but I just can't condone suicide or murder. The library book club will be discussing Where'd You Go, Bernadette at this month's meeting. The book is written in the form of emails, handwritten notes, flyers from school, reports, etc, and is a good read. (As an aside - I read the large print edition because it was the only one in at the library and felt like I was breezing through the book because I had to turn the page so often! LOL) The story centers around Bernadette, wife of Elgin, mom of Bee, and her struggle to fit in. Due to some misunderstandings she runs away and disappears, prompting Elgin and Bee to search for her. It took me a while to get into the story, then it took off and I couldn't put the book down, but it slowed to a crawl in mid-book with lots of repeated information, then sped up again to a very satisfying conclusion. The inclusion of an insufferable neighbor and her juvenile delinquent son, Bernadette's "secret" past as the creator of the Beefer Bifocal Home and Twenty Mile House, and digs at Microsoft (where Elgin works) and Seattle (where they live) make this an enjoyable read. I still have a huge pile of books in my to-read pile and a list of to-check-out books on my phone, but I'm always interested in hearing what you're reading and recommending - please share in the comments.